Welcome to Online Reasoning Test in AffairsCloud.com. We are starting Cumulus Course for Syndicate/Canara Bank PO (PGDBF) 2018 Exam and we are creating sample questions in Reasoning section, this type of Question will be asked in Syndicate/Canara Bank PO (PGDBF) 2018 !!! Directions. (Q.1 – 5) Study the following information carefully to answer the given questions. Seven Persons – A, B, C, D, E, F, and G – live on separate floors of a seven storeyed building, but not in the same order. The ground floor of the building is numbered 1, the floor above it 2 and so on until the topmost floor is numbered 7. 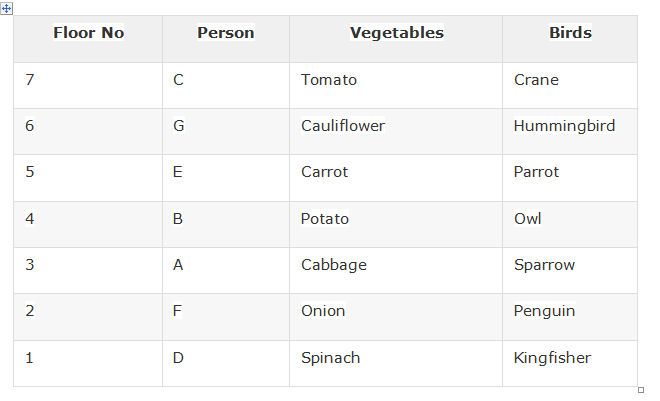 Each person likes different Vegetables – Carrot, Tomato, Spinach, Potato, Cabbage, Onion and Cauliflower, but not necessarily in the same order. Each person like different Birds namely viz – Parrot, Owl, Penguin, Sparrow, Kingfisher, Hummingbird and Crane. There are two persons live between the persons who like Crane and Owl. The person who likes Potato lives on floor numbered four. A does not live on the lowermost floor. A lives on any odd numbered floor below the one who likes Potato. Only two persons live between A and the person who likes Cauliflower. There are two persons live between the persons who like Parrot and Penguin. Only one person lives between B and F. F lives on an even numbered floor and does not like Potato. Only three persons live between the persons who like Carrot and Spinach respectively. The person who likes Carrot live on any floor above the B’s floor. There are two persons live between the persons who like Owl and Kingfisher. The person who likes Carrot does not live on the topmost floor. G does not like Sparrow. G lives on an even numbered floor but neither immediately above nor immediately below the floor of A. C does not like Carrot or Spinach. Only two persons live between D and the one who likes Potato. The person who likes Crane lives one of the floors above the floor numbered 5. The person who likes Cabbage lives on the floor immediately above the floor of the person who likes Onion. The person who likes Owl lives one of the floors above the floor numbered 3. The person who likes Parrot lives immediately above the one who likes Owl. There are two persons live between the one who likes Hummingbird and the one who likes Sparrow. How many persons live between the floors on which G and the person who likes Penguin live? Which of the following statements is/are true according to the given information? Answer – 5. All the statements are true. Who among the following likes Cabbage? Who among the following lives exactly between the floors on which E and A live? Who among the following does like Kingfisher? Ravi starts walking in south direction and walks a distance of 7km. Now he tooks a left turn and walk 6km. Again he takes a left turn and walk 15km and reached a point A. 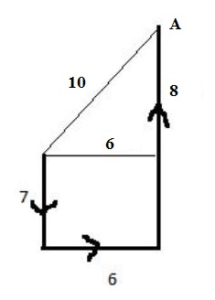 Find the distance between starting point and A. Which of the following indicates that ‘A is the paternal uncle of B’? What does the expression ‘P @ C = B © D & R’? Arun is fifteenth from the left end and Bala is eight from the right end. If there are 5 boys between them and Bala is to the right of Arun then what is the total number of students sitting in the row. What does the code ‘tl’ stand for in the given code language?